4 piece ceramic dinner plate set. 10" x 10" x 1.125". She's Mickey's longtime main squeeze, she has a lovely singing voice, and now she's yoo-hooing for a dinner invitation from you! Minnie Mouse is in the house! 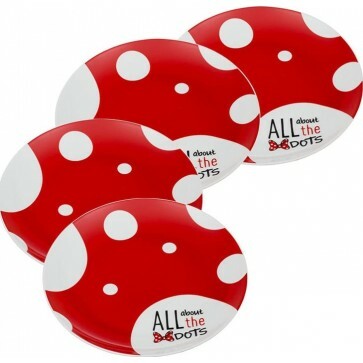 Make meal time fun and memorable with these Minnie Mouse Plates. Disney-fy your family dinner tonight! Perfect for everyday dining, fandom events, and collector gift sets! Crafted from high end ceramics with bright and beautiful character designs. 4 piece set. Product Dimensions:10" x 10" x 1.125". Dishwasher safe.